Money Trouble in New Hampshire? Summary of New Hampshire Usury Law(s) / Quote: "Legal: 10% / Contract: Any rate agreed to / Judgment: New Hampshire judgment rate is 2% over average U.S. 52 week Treasury Bill rate at their last auction prior to September 30 / Corporate: No specified rate"
Legal Maximum Interest Rates: Quote: "10% unless agreed upon in a written contract (§336:1)"
Judgment Interest Rates: Quote: "Determined by state treasurer as the prevailing discount rate of interest on 52-week U.S. treasury bills at the last auction preceding September in each year, plus 2% points rounded to the nearest tenth (§336:1)"
Legal Exceptions: Quote: "Educational institutions (§195-F:15); public utility (§374-C:14); pawnbrokers and small loans (§399-A:3); home mortgage loan (§398-A:2); consumer credit (§358-K:1)"
Deb and her husband spent many years raising their kids and getting them through college. Money was tight for them while they raised their family. The kids all have good jobs now and are doing well. Deb and her husband did not look out for themselves very well. They are about to retire and although Deb’s husband will receive a pension and health benefits in retirement, it will not be a lot for them to live on. They are trying to decide what to do over the next five years. They feel that they have to continue working and save as much as they can for retirement. If they do not, they might have to sell the house or worse move in with one of the kids. At the same time, they would like to go on a vacation, a trip of a lifetime really while they are still healthy and able to. They have some money saved, but will need a loan to help pay for the trip and also consolidate a few small bills. They want to be debt free when they retire and have decided they will work another 6 years. They are applying for a loan of $14500 with a six year term so that it will be paid off by the time they retire. Of course they would have liked to retire before six years but they just do not see how they can do that and still go on this trip plus save enough for retirement. The monthly payment over six years is pretty reasonable especially with a low interest rate. They have a great credit score and if they take a personal secured loan, they will be eligible for a very competitive interest rate. They can use their home as security for the loan since it is fully paid for. They will be paying this loan payment while at the same time trying to save funds for retirement. It is a tough decision to make. Travel now while they can and are healthy or save for retirement and perhaps go on the trip in four or five years time. Only they can make this decision since it is a very personal one and they understand their finances related to retirement. Many seniors today are finding that they have to work much longer than they planned to because they did not save for retirement. Taking out a loan at this late stage in life makes it more difficult to ensure there will be enough savings for their retirement years. They are fortunate in that they have a very good credit score, very little debt, their mortgage is paid for and they are both working which should make approval of a loan for them pretty straightforward. 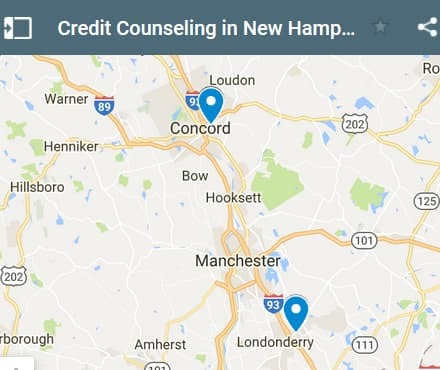 If you live in the State of New Hampshire and you're struggling to get a loan approval with a bad credit rating we hope our website helps you in some way. Last 5 debt service loans approved in the State of New Hampshire. Source: WFL Lender Pool. Updated Weekly. Principals rounded to the nearest $1000. Relative interest rates listed below in order left to right. 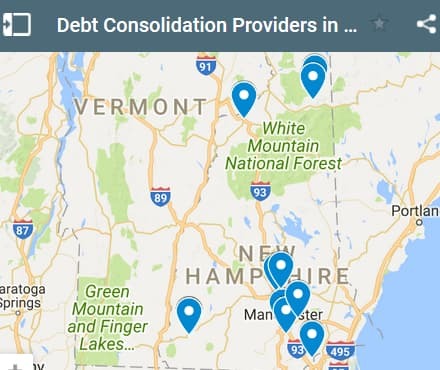 In New Hampshire there are some companies that help you with debt but don't forget to consider a self-serve option. In other words you can call up your creditors and try to negotiate a lower rate or principal. Of course this is actually a debt settlement in this example. For a consolidation loan you are simply borrowing cash to pay off multiple creditors. The most important thing is that you get a substantially lower rate on your new loan. Otherwise you won't be saving any money. Wayne would like to purchase an RV pad complete with outdoor kitchen, bar and patio area along with all of the hookups for water, sewage etc. He also wants to consolidate some other smaller loans that he has and a small amount on his credit card account. In total Wayne needs $25500 and he would like to repay this loan over a six year period. He already has the RV and he and his wife have travelled around to various places and rented a spot for a couple days and sometimes as long as a month. They still want to travel with the RV, but also want a place they can park it that they can go to for the weekend or a short vacation without having to pack everything up each time. This RV pad comes complete with outdoor kitchen, oven, sink and even granite countertops. All of the hook ups are also available of course and they plan to spend lots of time enjoying their new home away from home. This is a high end RV park. He has a small loan that he took out a few years ago. It is almost paid up, but he just wants to pay it off and make one monthly payment. The same applies to his credit card, although this month’s balance is a little larger than normal. They are preparing to move their new RV to the RV pad and spend a few weeks vacationing, assuming that this debt consolidation loan is approved in the next few days. Although they have not quite figured out the logistics yet, they have been told they can also rent this RV pad they want to purchase which really helps with the cash flow. If they can rent it a couple of months a year, the income will pay for the monthly fees for services that they will be obligated to pay in addition to the monthly loan payment. For the purposes of this loan application the lender will be assuming that Wayne’s income level and cash flow will need to be sufficient to carry both the loan and the monthly fees associated with this RV Pad purchase. Anything he makes from renting will be icing on the cake for Wayne. This is really an investment loan although he has applied for a debt consolidation loan. Wayne might be better off using either his home, his RV or the RV pad that he is purchasing as security for the loan. As a secure loan he should qualify for a more competitive interest rate and approval of the loan will also be much easier for the lenders. They like secure loans which minimizes the risk for them when they lend funds to consumers. Wayne is going to consider his options and then decide how he wants to proceed. He knows he has to decide quickly so that he can finalize the purchase and go on his trip. 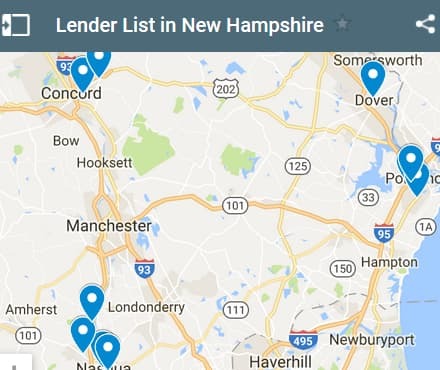 If you live in the State of New Hampshire and you're trying to get approved for a debt consolidation loan, we hope our website helps you find a good lender regardless of your credit rating.